Our history is well defined in an article published in the Angus Journal in 1995. Bill Clark has experienced 40 years of the Angus business and all it has to offer. From the fanciful belt buckle cattle of the 1950s to the advent of real world genetics and economics in the 1990s, this Houston businessman has seen it all. He feels it's a great time to be in the cattle business, but is driven by the vision of a beef industry where producers are rewarded for quality genetics and consumers are rewarded with a consistent quality beef product. Clark Angus has two operations, one near Huntsville, the other outside Crockett. A registered herd of 700 and a commercial herd of 300 are managed at these operations. Clark Angus Ranch annually produced 250 Angus bulls and 150 females to sell. With a reputation for breeding quality in quantity, buyers come from all over the United States, Mexico, Central and South America to take home Clark Angus genetics. A high percentage of buyers are repeat customers. Building a premier Angus herd has taken more than capital. It's taken dedication by the man, his family and staff, and the desire to make lasting improvements to the Angus breed. This dedication and his leadership abilities were instrumental to his election as president of the American Angus Association in 1974. 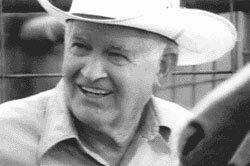 During his tenure on the American Angus Association Board of Directors (1966-73), Clark helped implement two landmark programs, which today are successful examples for the entire beef industry. "We began the performance program, which now has the largest database in the beef industry," Clark says. "We also began groundwork for the Certified Angus Beef Program, which is now the most successful branded beef program in the world." No wonder Clark places so much emphasis on performance and carcass traits in his own breeding program. "We breed cattle for moderate birth weight, rapid growth and positive carcass traits, " Clark explains. Our customers have become quite educated over the years about EPDs and now they've become enlightened about carcass traits. We are committed to giving them the best." With the numbers Clark Angus Ranch encompasses, it's a given fact that an aggressive artificial insemination (A.I.) program is important in building the genetic pool which has become a Texas mainstay." We believe in using A.I. bulls which offer us the traits we're looking for," Clark says. Clark Angus Ranch also relies on quality people to carry out this A.I. program. Ralph Glass, Clark's manager in Huntsville, has worked for him for 26 years. "He's a top A.I. technician and he knows the cattle," Clark says. It's also necessary to have good cleanup bulls available and Clark has a definite theory about that. "Too many people are willing to use just any ol' bull as cleanup," he says. "We don't agree. We want to buy the best genetics we can afford so we can be proud of the cleanup bulls, as well." The Clarks are familiar figures at Texas Angus functions. It's rare that a cattle sale is held in their state or neighboring one where they are not present. Bill also makes a point to attend national Angus shows and sales such as the North American International Livestock Exposition (NAILE) in Louisville and the National Western Stock Show (NWSS)in Denver. Clark, true to his word, doesn't think twice about spending $8,000 to $10,000 for a good bull. In fact, he makes it a practice to be in Denver each year to preview the National Western Angus sale bulls on "The Hill" and the bulls available in the carload competition in "The Yards." He usually purchases at least one bull each year to bring home to Texas. More of the same," Clark says. "We're going to concentrate harder on carcass genetics. We'd like to become involved in the CERTIFIED ANGUS BEEF™ Value Discovery Project and Texas A&M University's Ranch to Rail Program. Carcass genetics are the wave of the future and we want to be a part of it." Clark has weathered the storms…little cattle, low prices…nothing has discouraged Bill when it comes to raising Angus cattle. He's always out there looking for better ways to do things. The ability to sell what you produce is the greatest measure of a cattle breeder's success. No doubt, Clark has lived up to this standard. Still, it's his genuine character and reputation for an honest deal that makes him an admired and respected part of the Angus business in this part of the world.